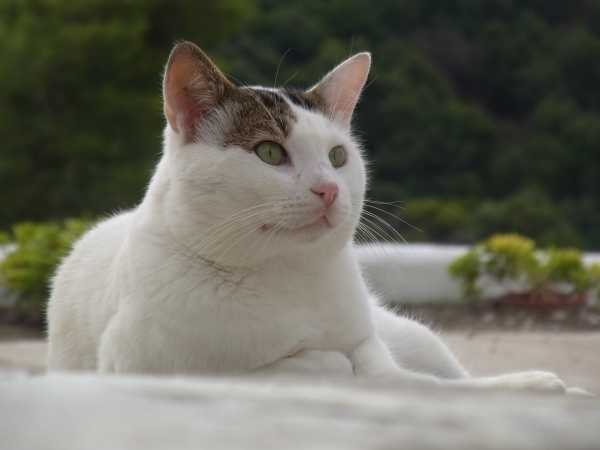 Mister Cat lives in the area around my parents’ little holiday home in Chalkidiki. It’s an area at the outskirts of a village, but it’s fairly wild: there’s a big wooded ravine where foxes and jackals and all kinds of creatures live, and that’s where Mister Cat grew up. It’s a tough life, but Mister Cat got lucky. Verena and I saw him stalking around the grounds, and decided to make contact. 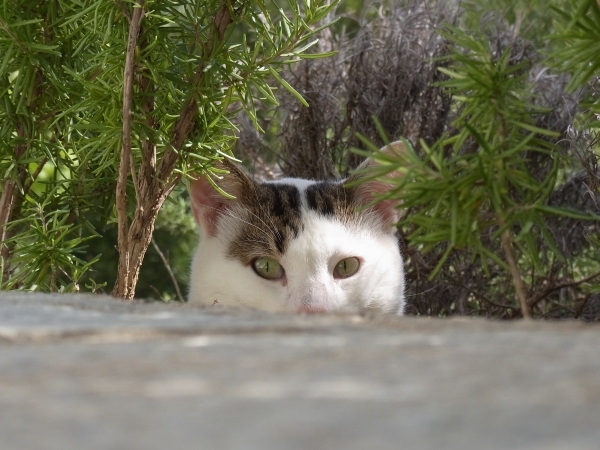 He was shy, much more so than any village cat, and I had to crawl down the rough concrete road on my hands and knees, carefully tossing him pieces of tuna, making sure to avoid any sudden movements that would cause him to bolt. But that worked, and he came back – carefully. My parents aren’t really animal-friendly people. They don’t hate animals, but they grew up in villages (one in Greece, one in Germany) at a time when the idea of animals as pets was mostly alien to people. You kept animals because you needed them, you fed them because they were useful. You could like them, but not get too attached to them, and you certainly must never let them come into the house, because that would be unhealthy and disgusting. Anyway, every weekend my parents would drive out to their little house, which they think of as the one ray of sunshine in their lives, to get away from the city and work in the garden… and feed Mister Cat. This went on for an entire year, and (as they do when cats are around) things started to change. When Mister Cat didn’t show up for a few weekends in the winter, my parents got worried. Originally they’d mainly wanted a cat because they kill snakes, but they’d gotten used to having him around every weekend, meowing loudly for more food, more food! They got attached. Mister Cat started changing, too. Bit by bit he became less shy. He started following my father around the grounds as he worked, or hanging out around the veranda when my parents were sitting outside. 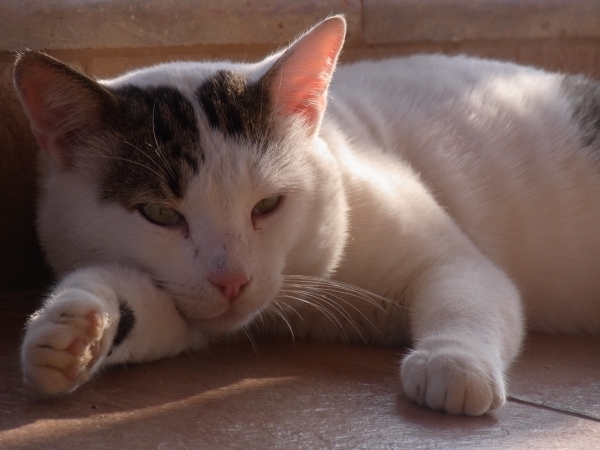 He likes sitting on doormats, so my parents put one in an open space under the stairs, so now he has a shelter of sorts right next to the veranda; he often sleeps there during the day, or in the bushes in front of the house. When we arrived here a couple of weeks ago, he recognized us and was ecstatic with joy. In the last few months he’s gone from hanging around with people to rubbing up against them, lying down next to them and even sitting on their laps. My parents aren’t quite ready for that, but they do go out of their way to do nice things for him. When they took us out eating in the Antigone, the best tavern I know and rather a rare luxury these days, they collected all the leftover fish for Mister Cat. He didn’t so much eat it as breathe it in through his mouth. Mister Cat is happy. He loves his humans so much he’s even started to purr. He wasn’t very good at it at first, never having had occasion to try it before, but he’s getting better. But the one thing Mister Cat doesn’t know is what austerity is. And why should he? He’s a cat. But austerity means that as of next week, my parents won’t be able to come to their house more than once a month, because the heating and travel costs are just too much. They won’t be able to come to this small, steep piece of land that they cultivated with their own hands because the people who own tens of thousands of times as much land have gambling debts that need to be covered with the money of regular people. Mister Cat won’t see their car coming up the concrete street that my father built himself in the sweltering heat, because the state owes him and other pharmacists tens of thousands of euros and simply won’t pay, and even my mother’s meagre pension (a reward for spending decades saving lives) is still inexplicably not arriving. And on top of that taxes, taxes and more taxes for working people, but no taxes at all for those who own everything. Mister Cat doesn’t know about how the government is destroying small businesses so corporations can finally gain more ground in a country that still has too many small shops. He doesn’t know about corrupt unions and EU politics and the troika. And so Mister Cat won’t understand why the humans he’s grown so fond of will stop showing up. Why he’ll wait in front of an empty house and an empty food bowl, hoping for someone to sit on the veranda with him, even if it’s the humans who shoo him away if he comes too close to the door. The other day the big human petted him for the first time and he was so happy, surely that must be progress? Yes, there are greater tragedies than Mister Cat’s. At least Mister Cat can hunt. There are plenty of human beings who will have it harder than him, who will suffer and in some cases break. But right now, as I look at this cat who has never been happier, who meows if I get up when he’s hanging out with me on the stairs, I can’t think about all that. All I can think about is goofy, friendly, ridiculously photogenic Mister Cat, who doesn’t know about what’s coming. Are those fictional numbers on a few bank accounts really worth it? Next PostNothing’s the same anymore.